Fr Niall Molloy, 52, above, was found beaten to death at the home of this friends, Richard and Theresa Flynn, in Clara, Co. Offaly, a day after their daughter’s wedding in 1985. Nobody has ever been convicted in relation to the death. Earlier this week, it was reported that the DPP had finished its review of a Garda investigation into the killing, and ruled no charges will be brought. Fr Molloy’s family are now seeking a commission of inquiry, to investigate all of the circumstances surrounding the priest’s death. Niall was my granduncle, being the youngest brother of my grandmother, Eileen Maher. He was from a family of five girls and three boys who lived just outside Roscommon town. Niall’s father, William J Molloy,was a successful businessman who had emigrated from Mayo to New York as a young man, and returned to Ireland to set up business with this brother in Roscommon town, and to raise his family there. From a young age, Niall and my grandmother carried on their father’s interest in horses. Niall was a very accomplished horseman and involved himself in showjumping, gymkhanas, etc…He entered the priesthood and was ordained in the 1950s in Rome. Niall worked in various parishes in the West, and also as an Army Chaplain in Athlone Army Barracks and on deployment in Cyprus. He always kept up his keen interest in horses. Prior to William Molloy’s death in 1965, he gifted Niall a sum of money in the region of £60,000 (not an inconsiderable amount at the time). Niall used some of this money to invest in horses, and it was in effect to be his retirement fund. Niall had been a friend of Theresa Flynn, nee Brennan, for a long number of years. Their friendship was based on a mutual love of horses. Theresa was married to Richard Flynn, a businessman. In later years they lived with a family of several children in Tober, Westmeath on a large farm. The sold the land and retained the house presumably due to financial pressure. They then bought the property called Kilcoursey House on the outskirts of Clara, Offaly, with surrounding land. Their son David Flynn resided in the house in Tober. Richard Flynn involved himself with various businesses including a small network of car accessory outlets. He was undoubtedly in financial difficulty at the time, and so the family was forced to sell the land at Tober, and downsize to Kilcoursey House. At this time, Niall was a curate in Castlecoote, a small parish about five miles from Roscommon town. He had taken over the parish and lived in a caravan for a while, as the parish house was in such bad condition that it had to be demolished. He lived in the caravan adjoining the church and eventually built a small bungalow on the grounds. He was extremely popular with all age groups in the parish, and was very approachable but was a generally quiet and gentle type of person. Niall Molloy and Theresa Flynn set up a business, jointly-owned, in which they dealt in horses and also purchased lands on the outskirts of Athlone town. Niall had a very good eye for horses and enjoyed the business. They bought and sold horses very successfully, and the horses were stables at Kilcoursey House. Niall very frequently visited Kilcoursey House to ride the horses, and they gave him his own room in the house, where he stayed if too tired to travel back to Castlecoote. Richard Flynn however was having further financial difficulties, so he asked his wife Theresa and Niall to buy some of the land surrounding Kilcoursey House. This would have to be subject to a ruling by the land commission, for the subdivision of the holding. The purchase price of the land was £35,000 and the deposit to be paid was £24,000. However the contract dated the 7th of September 1984 stated that the deposit was to be released directly to Richard Flynn by agreement. The Irish Land Commission then refused to give permission to subdivide the land in a letter dated the 14 February 1985, and so this would mean the contract was at an end. Niall was concerned about the return of his deposit (which was either £12,000 or £24,000) and he called to his solicitor, wondering how he could possibly get his money back from Richard Flynn. After his death, Theresa Flynn stated to the Gardaí that Niall had been repaid the deposit in cash, but there was no receipt. She gave two different versions of how the repayment was made, and then also stated he had been given cash from a safe in Kilcoursey House. 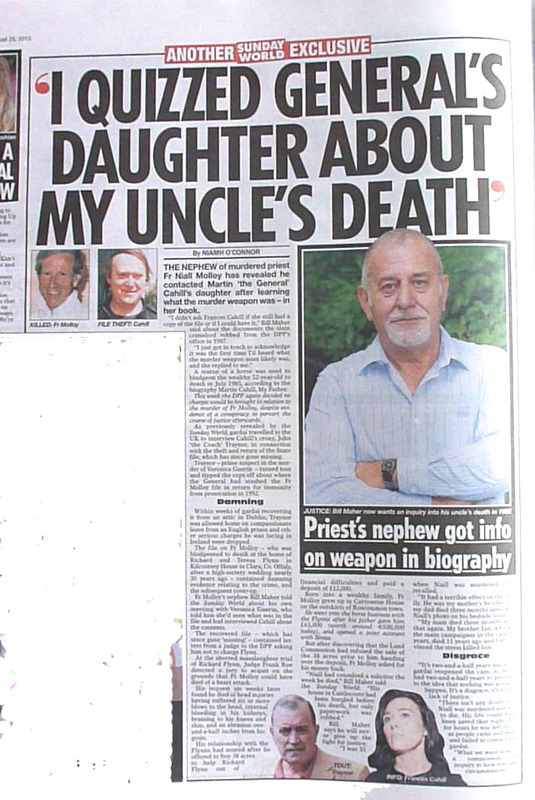 As a practising priest, Niall was obliged to make a will and to lodge it with the church authorities and his solicitor, more especially in view of the fact that Niall had travelled abroad with the Armed Forces. On his death, despite all searches made by the family no will was ever discovered. Niall’s house had been burgled a short time before his death. The local garda described it as the strangest burglary he had ever investigated. No money was stolen, but Niall’s desk was broken into and papers were gone through. It has been suggested the house was not broken into, but that however was there had access somehow. On July 6, 1985 Maureen Flynn (daughter of Richard and Theresa Flynn) was due to marry Ralph Parkes, a businessman. On the day Niall officiated a wedding in his own church in Castlecoote. He did not officiate the Flynn wedding. He did attend the after-wedding celebrations at Kilcoursey House, and returned home to Castlecoote that evening, being a Saturday, and then said mass the next morning. On that Sunday, July 7, a lunch was held in Kilcoursey House in a very large marquee on the grounds. Niall attended the lunch with approximately 50 guests, many of whom had been guests of the wedding the day before. Niall spoke with somebody who was not at the festivities in Kilcoursey at about 9 that evening. He brought a horse and trap out for a run, and having spoken to this person, returned to Kilcoursey. As far as the family is aware, this is the last contact Niall had with anyone outside the immediate environs of Kilcoursey. At the time of the investigation, the Gardaí did not even interview the nextdoor neighbours to seek a corroboration of events, which is inexplicable to say the least. Fr James Deignan, a parish priest in Clara, stated that he received a phone call at approximately 1am on July 8, from Richard Flynn, asking him to come to his home and anoint a person. Fr Deignan went to the house and gave Niall the last rites. He said he could not say whether Niall was alive or dead at that stage. He was lying on his back on the floor of a bedroom. He stated that he assisted Richard Flynn in trying to call a doctor, but failed to contact a doctor by phone, as he had forgotten his glasses. Dr O’Sullivan stated that at approximately 2am he was called by Fr Deignan and Zandra Flynn and requested to come to the house. He was shown into the bedroom, and he recognised Niall Molloy lying on the floor. He found him to be dead. He found Theresa Flynn in state of hysteria and gave her some treatment to calm her down. He then drove Theresa to Tullamore General Hospital in his own car. He advised Fr Deignan to notify the Gardaí in Clara. He stated that, at this stage, Richard Flynn was sitting downstairs in the sitting room in his pyjamas. Sgt Kevin Ford stated that Fr Deignan called to the Garda Station, a distance of 1km, at approximately 3.15am. Father Deignan told him a man was dead at the Flynn house. He told him that the dead man was a priest he did not know, and that he understood the priest had fallen against a wall and hit his head. He also stated that this was a terrible scandal in the parish and asked if there was any way it could be kept quiet. Sgt Ford told him that the death would have to be investigated, and Fr Deignan stated that Richard Flynn had told him he was the culprit. Sgt Ford stated that he arrived at the house, examined Niall’s body and the conditions of the bedroom which had bloodstains in various positions around the room, on the furniture, on the walls and also in an adjoining bathroom and on the bannisters on the way up the stairs. There was also a long drag mark of Niall’s blood on the carpet from the back of Niall’s head (measurements given are a distance of 8.5 feet and a width of 3 inches). There was evidence of broken furniture downstairs. Sgt Ford was downstairs and spoke with Richard Flynn who stated he was, to quote Sgt Ford, “seated on a couch with a mug of coffee in one hand and his other arm spread along the back of the couch. He appeared to me to be calm and cool and unconcerned. He was wearing pyjamas and dressing gown. He asked me to sit down and have a cup of coffee. He apologised for bringing me out at such an hour. He spoke about the wedding for a few moments and then said “It’s a messy old business” referring to the body upstairs. He stated that he struck Niall Molloy at least twice and probably three times in the face with his fists. He stated that he had been the victim of an unprovoked attack by his wife and by Niall Molly in his bedroom in an argument as to who was to go downstairs to fetch the next drink. The investigation was taken over by specialist gardaí and Sgt Ford had no further involvement in the matter. Richard Flynn appeared in Dublin Circuit Criminal Court on June 12, 1986 charged with the manslaughter and assault. The case was surprisingly taken from the list at callover stage by Judge Frank Roe, and after about four hours Judge Roe withdrew the case from the jury after legal submissions by Paddy McEntee on behalf of Richard Flynn. The state pathologist, Professor Harbison, had given evidence on the matter for the prosecution, and Paddy McEntee had put forward the idea that Niall Molloy attacked Richard Flynn, and in that attack had suffered a heart attack which could have killed him. Professor Harbison stated that he could not rule out the fact that a heart attack may have contributed to his death. Frank Roe then withdrew the case from the jury and stated that it would be unsafe to proceed any further for manslaughter or even assault. That decision by Judge Roe to take the case and to deal with it in such a fashion has been the subject of widespread criticism both within and outside the legal profession. It is now widely known that Judge Roe knew the parties involved, and was a close friend of Richard Flynn, yet he decided to take the case himself on the morning of the trial. A public inquiry was sought at that stage, and Mr Alan Dukes TD, who at the time was Minister for Justice stated that a public sworn enquiry by way of public inquest would be heard, and it, in turn, lasted three days in Tullamore Courthouse in July 1986. The unanimous decision of the jury at that inquest was that Niall had died as a result of injuries to the head. Niall died wearing a gold wristwatch which was returned to the family by gardaí in a matter of days. The watch had been damaged, and its glass face was cracked with the hands stopped at 10.40pm. This crucial piece of evidence should have been retained by the Gardaí, but it was not and was hence contaminated, with the net result that it could not be used as official evidence in any further hearing arising from the matter. (I have the watch now). Richard Flynn and Theresa Flynn were under serious financial pressure and were heavily indebted to the Revenue Commissioners and to Barclay Bank for a combined sum of roughly £400,000. Kilcoursey House and lands were subsequently sold. Theresa Flynn then filed a claim with the Combined Insurance Company in an effort to claim on life insurance policy on Niall Molloy. The claim suggested that Theresa Flynn was a sister-in-law of Niall. When further information and a death certificate were sought by the Insurance company, the claim was dropped. Despite the fact that Niall had been given £60,000 by his late father, and despite the fact that he was a very successful businessman in horses, Niall’s estate had been completely dissipated at that stage by person or persons unknown. A solicitor who acted for Niall and Theresa Flynn in their partnership refused to furnish files relating to the partnership to the administrator of Niall’s estate. The solicitor in fact denied ever working for the partnership, but by good and thorough investigative work, it was discovered that the solicitor had indeed acted for the partnership. As a result this solicitor was brought before the Incorporated Law society of Ireland and Mr Justice Declan Costello in the High Court where he was fined for his misconduct and refusal to hand over papers. It was at this stage that my father, Ian Maher, a nephew of Fr Molloy (and the administrator of his estate) became heavily involved in the affair. He travelled around the country talking to witnesses, and conducting much vital detective work that the original investigating gardaí never bothered with. Around this time we were subjected to intimidating phone calls for months at a time, strange cars parking outside the house, and at one stage a house my parents owned was burnt down. Planning permission to rebuild on the land of the destroyed house was repeatedly blocked by politicians from Fianna Fáil. In the meantime, Veronica Guerin published articles to the effect that a number of files had been stolen from the DPP’s office in a robbery orchestrated by “The General”, Martin Cahill. These files included the file relating to Niall Molloy. Veronica Guerin stated in her documents that she had seen this file. She stated the file included 2 letters from Frank Roe to Eamonn Barned, who was then the DPP, in relation to the trial of Richard Flynn. She suggested that this correspondence was entirely improper and illegal. She also claimed that this file was used as a lever to blackmail the gardaí in order for a deal not to prosecute well-known criminal John Traynor. She stated that when the deal had been agreed, the original of the file was returned to the Gardaí, with the criminals keeping copies for their own protection. Warning shots were fired into veronica Guerins house, and she was subsequently murdered on the Naas dual carriageway. The contention that the file has been used by criminals to obtain an assurance that no prosecution would arise against John Traynor has been stated to be fact by Paul Williams, the crime writer, in his book which was published in 2011. We, as a family, have written to the Garda Commissioner on a large number of occasions asking him to respond and hopefully to deny these allegations. He has refused to reply to the any correspondence to date. I would have hoped a simple denial would not have taken that amount of time. The lack of a response is worrying and absolutely unacceptable, and leads me to the conclusion that this allegation must be true. If that is the case, then the file had a considerable value, which in turn confirms Veronica Guerin’s report of its contents in my opinion. The evidence at all times furnished by Richard Flynn was to the effect that he hit Niall with his fist on a small number of occasions, and that Niall perhaps hit his head a number of times thereafter when he fell to the ground (this has been mockingly called the “pinball defence” by some). Theresa Flynn, who stated she was in the room at the time of the assault, was not a compellable witness against her husband. She also claimed memory loss for events surrounding the death. It had believed that Niall died relatively quickly as a result of these assaults. However, in October 1988, my father Ian Maher furnished a copy report to the Garda authorities which had been prepared by Professor Dermot Hourihan, Professor of Histopathology, of Trinity College Dublin. Professor Hourihan had prepared his report from the medical evidence as outlined in the autopsy report by Dr Harbison. 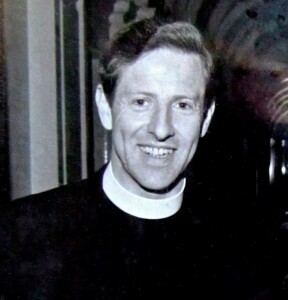 Professor Hourihan stated unequivocally that Niall had died following brain swelling. He formed the opinion that an injury to Niall’s jaw was most likely caused by a shod foot. He stated that he also believed that an injury to the inside of his thigh was suggestive of it having been struck while Niall was lying on the ground, and he furthermore suggested that bleeding around the outside of one kidney suggested a sever blow to Niall’s back, probably a kick, and also probably delivered while Niall was lying on the ground with a flexed back, or in a bent position. He felt further that the bleeding over the inner aspect of his collar bone was more suggestive of a kick rather than of a blow struck by a fist. He was of the view that Niall lived for hours rather than minutes after the attack due to the fact that the subdural bleeding was from small blood vessels with low pressure, and due to the fact that they were found on both sides of the brain. When this report was handed into the Gardaí in October 1988, my father was told that this was crucial important new evidence, and that the case would be reopened. It contradicted the version of events given up to that time, and proved that Niall had been viciously assaulted and left to die over a long period of time. However, within a number of days the Gardaí called my father again to say the case would not in fact be reopened. He was never told any reason for the sudden change of heart and was left very distraught at the situation. In her controversial book about her father Martin Cahill, Frances Cahill makes revelations about details of Niall’s death , which she alleges, are contained in the DPP file which Martin had access to. “She wrote: “My father recalled that the priest’s head had been bashed in with a statue of a horse, information that allegedly came from the DPP’s file on the case”. On May 24, 2011 Dr Francesca Brett, Consultant Neuropathologist of Beaumont Hospital provided a report which was compiled from an examination of slides taken from Niall’s brain. (The Gardaí have asked my family to return these brain slides, but we have refused). She reported that in her view Niall lived for a period of six to 12 hours post injury. This report was submitted to the Garda in May 2011 by the family after the Garda Commissioner made an announcement to the effect that the case was to be reopened in November 2010. On August 15, 2012 Professor Michael Farrell examined the same slides (in the presence of Gardai) and reported findings which are consistent with those of Dr Brett in relation to the period of time between the assault and death. Following the DPP’s decision we have a family feeling however that the only way this case will come to any sort of satisfactory conclusion is through an independent investigation completely separate of the Gardaí. The Gardaí botched the initial investigation, and have refused to deny dealings with criminals over the file, so we feel they are not to be trusted to investigate themselves in this matter. We are therefore seeking a Commission of Investigation under the 2004 Act. We fell we as a family are entitled to this. It should be pointed out, however that this has now become much bigger than Niall Molloy and his family. The case with all its difficulties and failures goes to the very root of the legal system in this country and it demands proper forensic examination of the management and control, or lack thereof, of the original investigation into Niall’s death. The family of priest Fr Niall Molloy is focusing on garnering support for an independent inquiry into the circumstances surrounding his death after news that a review of the case by the Director of Public Proseuctions in recent months will not result in prosecutions. Fifty-two-year-old Roscommon priest Fr Molloy died after a society wedding in the Clara house of Richard Flynn in 1985, but nobody has ever been convicted in relation to his death. Speaking to the Offaly Independent this week Fr Molloy’s nephew Bill Maher said he’s happy there are now no obstructions to setting up an inquiry. Mr Maher told the Offaly Independent this week that he “wasn’t surprised” a review of the case by the DPP led to a decision no prosecutions would result. Mr Maher and his cousin Henry McCourt were told the news at a meeting in Dublin with Detective Chief Superintendent Padraig Kennedy and Detective Superintendent Christy Mangan last Tuesday week. He did admit to being disheartened however. Mr Maher has always been in favour of an independent inquiry into his uncle’s death. Welcoming news last June that a file on the matter had been sent to the DPP, he said he still wanted a full inquiry into what happened in 1985 and the DPP review didn’t change his quest for that. 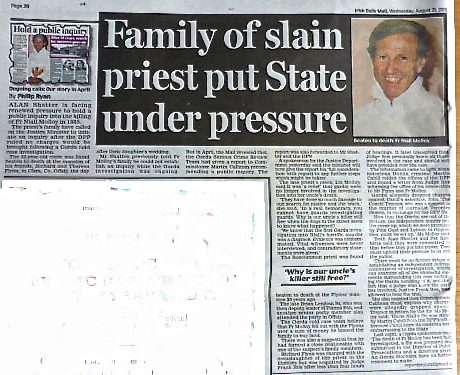 Last November Senators John Kelly and John Whelan called for the establishment of an inquiry into Fr Molloy’s death. The senators said at the time that while the case was distressing enough, the fact that nobody has ever been convicted in connection with Fr Molloy’s death continues to cause distress and public disquiet. The two senators arranged a meeting on the matter in Leinster House in early March, which was attended by upwards of 70 public representatives. Senator Kelly also put pressure on Justice Minister Alan Shatter to set up a public inquiry last April, calling the case the biggest cover-up in the history of the State while speaking in the Seanad. Mr Maher is also now pushing for a public statement from the Garda Commissioner regarding a file belonging to the case. Crime reporter Paul Williams claimed in his book ‘Badfellas’ that Dublin criminal John Traynor returned a stolen garda file on the case in return for charges being dropped against him.